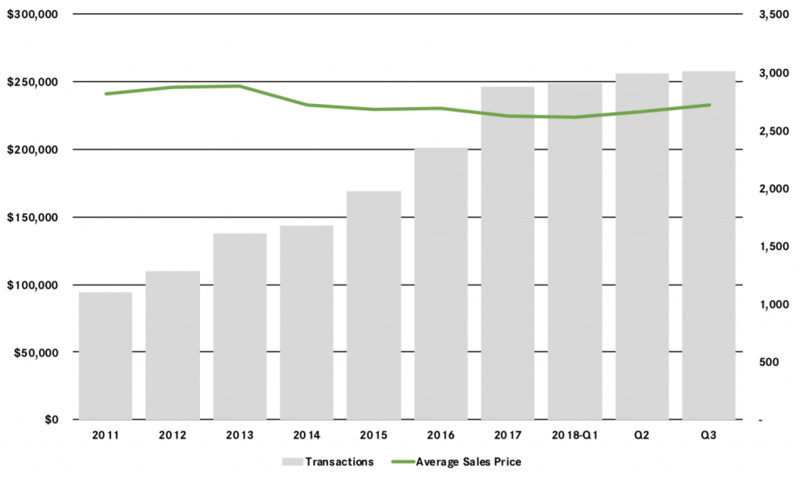 The Sussex market surged yet again in the third quarter, with small increases in sales coupled with a dramatic jump in pricing. Transactions were only up about 2% for the quarter, but that finished a year where sales rose over 9%. That’s a pretty robust showing compared to other markets in the region. This strong buyer demand is having its expected impact on pricing, with the average price spiking over 8% and the median up over 5%. And we’re starting to finally see some long‑term price appreciation, with the average price up 3% for the rolling year and the median up just a tick. More importantly, inventory has finally come down to manageable levels, almost to the six‑month level that usually denotes a seller’s market. Going forward, we expect continued strength in sales coupled with meaningful price appreciation through a strong fourth quarter and into 2019.